I snagged a luscious small oil on wood piece by Brooklyn-based painter, Liz AINSLIE at the Nurture Art charity fundraiser a few months back. Called “Some Pieces” (2005), it’s been a pleasure getting to know Ainslie’s fuzzy geometric shapes that swim on a agitated pool of turquoise. 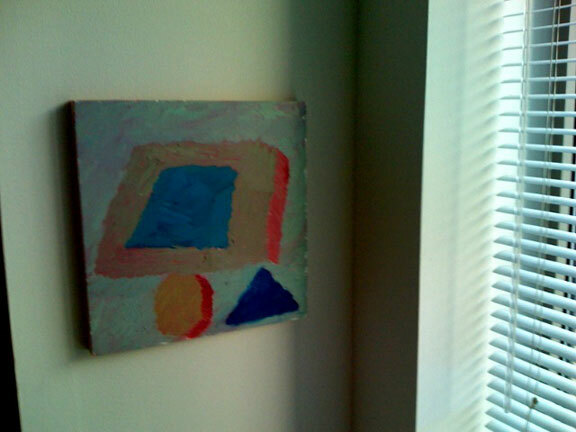 Hung beside our living room window, its warm colors become electric under the constant stream of sunbeams. I sometimes forget that Manhattan’s light has a wide spectrum and each variation can ignite a new life in the panel. It makes me wonder why all contemporary New Yorkers don’t welcome works by local artists into their lives. There is something wonderful knowing that the beautiful thing on your wall was created by someone you will one day encounter on the street or in the subway.